Guide Your Tribal Civilization to the Modern Age and Beyond! Get ready for a blast from the past with Forge of Empires! In this thrilling game of strategy, you will go back in time and change history by building a civilization of your very own. Which era of history are we talking about? All of them! Starting with a small tribe of hut dwellers in the Stone Age, you will chart a course across the millennia. Determine how history unfolds in the Bronze Age, Iron Age, Middle Age, Industrial Age and beyond, develop all sorts of thrilling new technologies, and spread your influence across the land through either diplomacy or war. With you at the helm, the future looks brighter than ever. Forge of Empires lets you shape the human race before history was ever recorded. Starting with a humble tribe of hunter-gatherers, you will go forth to create the largest and most technologically-advanced culture the world will ever know. • Research over 200 technologies for weapons, shelters, governments, religions, vehicles and more! • Watch your civilization change and grow over the ages. Begin with a small village of primitive huts and end with a massive city of skyscrapers. • Set the layout of your city. Build age-appropriate roads, houses, military barracks, factories and monuments. • Manufacture goods to earn extra coin and make your people happy. Conflict is the cornerstone for all human history, and nothing causes more conflict for humans than even more humans. In Forge of Empires, you will inevitably encounter other groups in your travels. You'll have to deal with them one way or another, for if you don't, they most surely will deal with you. • Attack rival civilizations outright or see if you can reach a more peaceful resolution. • Send spies in to infiltrate the enemy ranks and see what you're up against. • Expand your empire by conquering enemy territory. • Fight strategic turn-based battles against enemy armies. Set up ambushes, flank from the side, and use the terrain to your advantage. • Use a variety of weapons that evolve over time. Begin with simple spears, fight with swords and axes, upgrade to firearms, deploy armored tanks, and more! 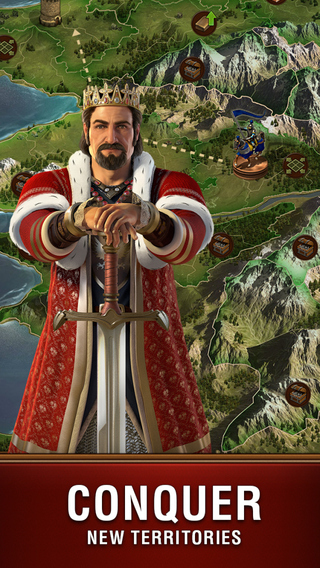 With the Forge of Empires app, you can systematically assemble your perfect civilization from the very beginning. Watch as humanity evolves from Stone Age cave dwellers to Space Age astronauts. Can you lead the human race to a new golden age set in the far future? Play Forge of Empires now and find out! 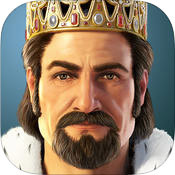 City-builders are nothing new for mobile games, but Forge of Empires really takes the genre to a whole other level. It's not enough that you have to build a thriving civilization based on a specific historical setting. In this game, you'll be building a thriving civilization across just about every historical setting. Add on a deeper layer of strategy that most apps of this stripe don't even consider, and you have a game that feels less like Farmville and more like Sid Meier's Civilization. Does it sound like a dream come true? You could consider it one, provided you have deep pockets and the patience of a saint. 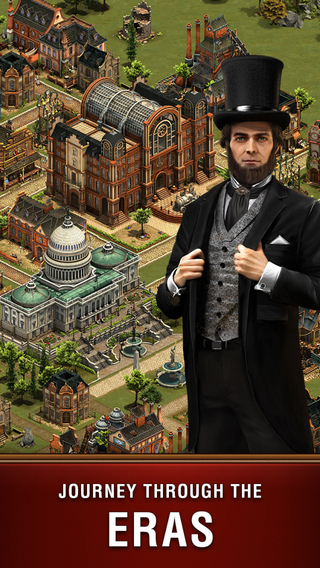 All things considered, Forge of Empires looks pretty nice. There's a good level of detail to the background environments and buildings, though the unfortunate absence of people wandering around make things feel a little dead. Fortunately, the game more than makes up for it with the sheer number of buildings it has available. They cover a wide variety of architectural styles across the ages. You start out with primitive huts, but can move on to medieval castles and cottages, sophisticated Victorian estates, 20th century skyscrapers, and even futuristic buildings we normally associate with science fiction. The end result is that you can and will build a city that changes over time. It might look like a village in the Middle Ages at one point and a metropolis like New York City at another. Watching it evolve feels like a surprising accomplishment. The music is very good too. Fittingly for a game that's largely about building, the game features a very low-key soundtrack that's soothing on the ears and never gets distracting. It also throws in some ambient sound effects, like the laughter of children or the cawing of birds. It's a small thing, but it does wonders at putting you in the moment. Forge of Empires starts out familiar, albeit with very limited things to do. Your village is tiny, you only have a couple of things to construct, and the real estate you have on hand is severely restricted. A quick look at the menus will show you why; this is a game that emphasizes research. The technology tree is absolutely massive, with over 200 kinds of things to learn that represent more than 5000 years of accumulated human knowledge. These technologies cover a wide range of objects, techniques and concepts like different religions, advanced weapons, better vehicles, new buildings, improved soldiering techniques and so on. Researching new things unlocks more buildings for you to make, and with that idea in mind, you'll quickly realize that Forge of Empires probably contains the largest catalogue of structures you'll find in any mobile game. Advancing from one age to the next is a simple process of working your way down one end of the tech tree to the other. However, researching isn't free. Learning a new technology requires investing a certain number of Forge Points into it, which are in limited supply like all things are. The game will automatically hand them out over time, but if you want to play at a steady pace, then you'll want to buy more. Points can be bought with coins that you earn in-game or with diamonds that serve as this app's version of hard currency. If you want to spare your bank account from any aches and pains, then the most efficient thing to do is to find better ways to generate coins for you civilization. Generating income in Forge of Empire works as expected. Residential homes produce coins from time to time, with better quality houses giving more. There are also a number of goods you can produce that can also be sold for a pretty penny. However, space is limited and buildings need to be connected via roads to get any use out of them. Careful planning for the layout of your city is vital, because expansions are few and far between. While the game may restrict your creativity, it also calls for you to be more strategic than usual. Everything you need to improve your technology is scarce, so trying to find the most efficient use of your resources is a fun challenge. Unfortunately, there are a few things that noticeably mar the experience. For one, building roads is a tedious process where you can only set one segment up at a time. More seriously is the fact that after a certain point, your expenses reach ludicrous levels that your in-game money-making abilities just won't be able to match. While individual Forge Points are cheap, later technologies require an astronomical number of them to learn. It certainly is possible to build a futuristic empire, but reaching that point requires a huge investment in time, real money or both. Fortunately, Forge of Empires isn't just another waiting simulator. Like any good civilization builder, there are outside civilizations that you'll have to periodically deal with. While the app may not have the sophistication of most 4X strategy games, there's still a decent variety of ways to interact with your neighbors. They have land that you'll want to take, since additional territory gives you more resources and unlocks space for your city to expand into. One way to acquire territory from rival civilizations is to simply trade manufactured goods for it. However, as great as a peaceful civilization can be, being a warmongering one is even better! You can declare war on your enemies and steal their lands for yourself in a process that's surprisingly fun. Battles are turn-based strategic affairs that take place on a hex-based grid. The object is to eliminate every enemy army, and you're encouraged to use the terrain to your advantage every step of the way. You can hide your warriors in the trees to set up ambushes, attack foes while their backs are turned, or make use of higher ground. Fighting is immensely fun and it gets even better as your weapons and soldiers grow more advanced. You may start out with plain old spearmen, but you'll eventually move on to knights in shining armor, cavalry, musketeers and modern-day GIs. With ample research, you can even add in siege weaponry and tanks. With the better weapons and troops you can unlock, late game combat feels like a world apart from that in the early game. With the focus on an evolving civilization, Forge of Empires comes off as much more far-reaching than other city-builders. Learning new technologies in this game feels like an accomplishment, as the very face and personality of your city will change over time. Combat is also immensely fun and it shows a great level of depth seldom seen in mobile games. Unfortunately, most people won't get to see the more exotic stuff at the end because of the miserly resources you're afforded. If you're okay with advancing your civilization up to only a point, you'll probably find a lot to enjoy out of Forge of Empires. However, if you're the kind of player who wants to see everything, you will probably be left wanting. Don't take it the wrong way; it's a good game, but it's too slow to be a great one.